Starting with the 2016-2017 academic year, ACT has replaced the subscores (UM, RH, EA,…) with reporting categories (POW, KLA). To accommodate the new reporting categories we have released a new ACT test type, which will show up in your PREP.BubbleScan account as ACT (2016). 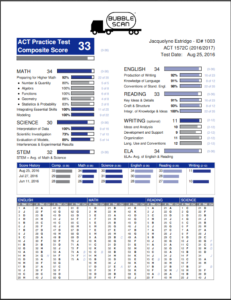 It comes pre-loaded with the answer key for the official ACT practice test for 2016-2017 (http://www.act.org/content/dam/act/unsecured/documents/Preparing-for-the-ACT.pdf), 1572CPRE, which is the same test that was used last year, only that it contains the new reporting categories in place of the subscores. The current ACT tests are shown in your acount as ACT (2015). Student reports will show both ACT (2015) and ACT (2016) tests in the score history. This means you can use them side-by-side for as long as you want. As new answer tests become available, we will add the corresponding answer key to our database so everyone can use it at no additional charge. There should be one coming for the September ACT as soon as we get our hands on one [hint, hint, if anyone has it, please share it so we can add it to our database]. In addition, we have started to recategorize some of the older practice tests. If this is of interest to you, we are making any answer keys we have recategorized available for $15 through our new online store (http://bubblescan.com/shop/). Currently, we only have recategorized keys for ACT tests 1267C and 0964E. 0359F and 0661C are in the works. Next on our list are 1163E and 1460E, the two official practice tests one can purchase from ACT. If you are interested, please send a list of answer keys you want recategorized (in order of importance) to joerg@academytechnologies.com. Between your interest level and the popularity list we develop from your responses we will then determine what tests to recategorize next and at what pace. You can of course recategorize answer keys yourself, but I will cover that in another blog post.